System Mechanic is a professional Windows optimization software from iolo technologies. As you all might now, the speed and performance of any PC will degrade from time to time. The main reason for this is the junk files and registry errors that gets added up during software installation and removal. We have been using System Mechanic from its version number 5. It’s an impressive software that has several inbuilt tools that can be used to scan and fix Windows problems automatically. Iolo recently launched System Mechanic 10 and System mechanic 10 professional editions. System Mechanic 10 professional is a complete package that includes five award winning software titles from iolo. The total package worth $300 retails at $69.9 for one year activation serial key. We are giving away one license of System Mechanic 10 pro edition free for our readers. All you need to do is comment here with your thoughts on Iolo System Mechanic 10. Windows automatically create files, folders and registry entries when we install, run or remove programs. These junk files and registry entries keeps adding up in our system and result in consumption of system resources. Unwanted registry calls lead to a slower system startup and application response. Moreover, it may cause errors that prevent Windows from booting and opening applications. There are hidden settings in Windows and web browsers that can be tuned to get maximum internet connection speed. Iolo System Mechanic 10 take care of all these things and fine tune them to the best value required for optimized performance. Some of the features of System Mechanic 10 standard and Professional editions are given below. Wizard driven operation for scanning junk files, registry errors, vulnerable system security settings, and other PC problem automatically. Program Accelerator in System Mechanic 10 arranges Windows software components in such a way that they become faster and responsive. CRUDD Remover™ in System Mechanic 10 scans and removes unwanted programs and duplicate files. Tweaks hidden software settings to speed up Windows. Privacy eraser to clean Internet history, recent documents and other sensitive data traces from Windows. Tune-up Definitions: Iolo releases periodic virus definitions and PC tune up settings through live update services. All customers will get these definitions free within the subscription period, that is one year with our free activation key. Any Major update for System Mechanic in this period are also given free for all users. Apart this, iolo System Mechanic 10 Pro edition includes iolo System Shield (Antivirus+ AntiSpyware+Firewall), Online backup, iolo DriveScrubber and iolo Search and Recover (File recovery) tools. Iolo online backup in System Mechanic 10 automatically backup all your imporatnt data to a secure online folder. You can access them from anytime, anywhere in the world with an internet connection. Iolo DriveScrubber in System Mechanic 10 helps you to delete files and history traces in such a way that it is not recoverable using software tools or government agencies. iolo Search and Recover recovers accidentally deleted images, movies, music and other data that are still present in the magnetic medium of your hard disk. Iolo usually provide an online installer for System Mechanic in their official website. So if you want to install the software in multiple machines, its better to download the full offline installers given below. Download System Mechanic 10 full offline installer here. Download System Mechanic 10 professional full setup here. We have already purchased System Mechanic 10 pro, and as shown above, the license is safe in our mailbox. 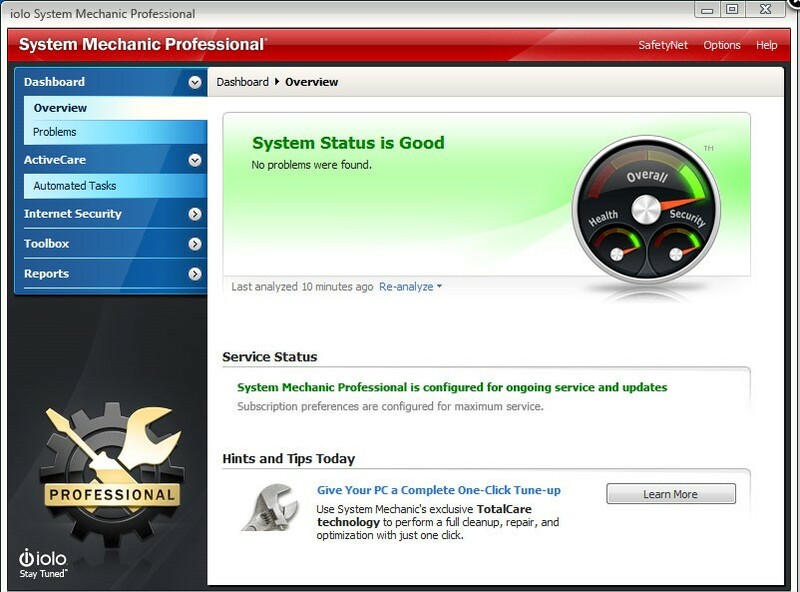 One year subscription to System Mechanic Pro service costs around $60. When you get System Mechanic 10 pro, you don’t need to buy any other antispyware, file recovery, online backup or file eraser tool. Furthermore, the iolo home licensing feature introduced in System Mechanic 10 lets you use the activation key in all computers that you own. That means, if you have two PCs and one laptop, you can use this serial in all these machines. Last week we have conducted a Norton Internet Security 2011 product key giveaway. Conditions for participation are almost the same. Subscribe to our email newsletter, promote this giveaway through Twitter/Facebook or publish this information in a public forum. All actions lead to one point/entry each and will improve your chances in the Random. Org draw scheduled for 16-10-2010. Last but not the least, leave a valuable comment here with links to all your entries. Thanks to iolo technologies for offering us three more System Mechanic 10 Professional licenses. Now we have four System Mechanic Professional serial numbers ( 3-PC license) worth $ 200 in our hand. Participate and win your copy. Update: System Mechanic 10 winners are achu, Nathan, Frankie and Luchriste. Please contact us to get your key. Iolo system mechanic is a great utility which everyone must have on their computers ,It is the best software i have ever used. It really speeds up the system by scanning and fixing the problems that are slowing down my pc.It removes junk files, registry errors, vulnerable system security settings, and other PC problem automatically. It also has a privacy eraser which clean all your surf traces over the net and its file recovery Action is the best . It also get periodic virus definitions and PC tune up settings through live update services. It is a world class product and i really want it. I hope i won a free license……. Seems that you have copied a little bit from the article :D. Anyways all the best, spread the news through Twitter or Facebook and increase your chances. Sorry sir ,for copying a little bit,sir i have used iolo system 2 years ago at that time it does not have virus definitions updates it only has antispyware,but i love this soft and i damn want this soft beck on my pc,that’s why……. I love system mechanic pro. it’s really useful. For the last two years I am using this System Mechanic 9 Pro version and never had a problem with my pc. recently extended the time till to Mar 2012 for system Mechanic only. If I could get the license of this System Mechnaic Pro then it will be a great use for me. And more to say System Mechnic Pro has additional feature such as anti virus check facility, hence no need to add any antivirus software. Thus I am interested in getting the the System Mechanic Pro 10 licence key. Since from October 2008 I am using System Mechanic Pro 9, till date I never had a problem with my PC. Most of the time I use to test the new software available on the net. I could get the System Pro 10 license from you then it will be grate help, thus i can use the said software continuesly for another one year. I prefer System Mechanic 10 as the number one comparing with others. System Mechanic Pro is the most advanced system “toolbox” I have ever seen! After a quick optimization, my pc was nice and fast. I’m very, very, impressed with the definition library of System Mechanic too! System Mechanic Pro looks like its a great tool to help PC protection. Cant wait to get a serial key, activate and protect my pc ! I just downloaded the trial version of system mechanic pro edition 10. This program works great. It fixes all the stuff that you would normally spend hours trying to do by yourself. System mechanic is like a mechanic for my pc..My pc really need an overhaul now..
System mechanic 10 pro is like a mechanic for my pc..My pc really need an overhaul right now. I used System Mechanic 6 months free trial before & was deeply impressed by it’s features. I think this is the best utility & hopefully can win 1 license of Pro version with the AV protections. I would like to compare iolo and Sym 360. I heard that iolo anti-virus was not so fantastic for others. Just give me an opportunity to make my pc become comfortable. @MASA I am not sure, but I heard that Iolo is using the Kaspersky Antivirus engine in System Mechanic Professional. So a good antivirus+firewall+great PC tuneup, online backup, deleted data recovery, secure file deletion- isn’t that great? In my opinion System Mechanic is a good application because it gives the user the possibility of doing automated tasks, and a lot of these so called “tune up” tasks are really boring to do manually, yes I know that a lot of things you do using your computer are no fun at all (p.e. scripting and other routine things) but I’ll never grow tired of using shortcuts especially if I’ve a lot of work to do. But Sytem Mechanic is also one of the best application a common user can use (a person who is not familiar with the windows registry or the command line just to give two examples) and it prevents a Windows OS to have a short life, so I always recomend to give the trial version a try and then purchase the full version. please ! would you like give me a serial ? thanks you ! System Mechanic always be top 3 of the best utility. The Pro version build in with Antivirus & Antispyware enhances more protections. Please count me in for the giveaway contest. I had tried this before as verseion 9 and try right now the version 10 (only 17 days left)..
Its a great program!! One of the new stuff is a more trough defragmenter called “Program Accelerator” that is ways better then the old one. System Mechanic is great software that has been around for many years and keeps up with all the changes that Microsoft offers to various Windows versions and improves them with performance and reliability. No other software can compete with system mechanic. System Mechanic is Powerful utility. and please count me in this giveaway. Thanks and congratulations for the giveaway. I won NIS 2011 on previous giveaway. Please don’t count me in. Maybe this giveaway is for other readers who need it. In my opinion, system mechanic is a good application. Many tools in just one package! vote for this. Please conut me in for this giveaway. Thanks so much for holding system mechanic 10 pro giveaway. currently i used system mechanic 9 six months license and it will end license period soon. So i intend to enter in. I’d used System Mechanic years ago, way back in the Win 98 days; for some reason I stopped using it, but recently “found it” again. It’s a great program that keeps your computer humming along. I loved the new “Gadget” feature on my desktop…all I have to do is click on it and it cleans my computer beautifully. Hope I win a licence for the new version. Thanks for this giveaway as System Mechanic is been a all around solution for your PC. Already subscribe to the mailing list. I hope I can still get one of your license key. I think System Mechanic is the best tool for windows optimizing. Thanks. System mechanic is best among its category. Twitted here http://twitter.com/pantherchd/status/26525888805 . Hope i get one. Thanks in advance. This is a great program. Since installing it (trial version) my computer runs like clockwork. I tried the program and I think that System Mechanic is just the best tool on it’s class. Something that I’d like to see in the next version of System Mechanic is a graphic disk usage browser wich can be used to quickly find out how a partition’s space is distributed among the file system hierarchy. System Mechanic is best pc tuning tool. Hi . I really need a license . Thanks a lot for giveaway. system mechanic is very good tuning software. thank you for giveaway. Drewser714@gmail.com is my email. Please, My computer really needs help. Registry Mechanic didn’t help. Does this software have a working trial? I get paid on the 15th or I would buy it now but unfortnefanetly, I somehow got infected by someone who has Tuberculosis. So I went to Beth Israel in New York City and the next thing I know they lock me in a room with special ventilation. I should be fine but I don’t feel like it. I think it is very kind of you to offer to give this away. I never get lucky but I deserve it this time. Just once in my life. Thank you and best regards no matyer what. For many years I have done all my tweaking by hand, and considered it “Professional Pride” that though I recommended System Mechanic, it was for my customers, not for me. Earlier this year, however, a computer was giving me all sorts of grief. After a weekend of no results, I decided to let System Mechanic do the work and see what it came up with. I quickly found I was wasting my weekend (and probably a great deal longer in total). System Mechanic found and resolved a good number of issues, and has stopped me from pulling out the hair I have left. Solid product, with real results. Sounds like a wonderful application. Ideal for a tech. retard like me. Please include me in this giveaway ! Iolo technology is a great compagnie that system mechanic 10 pro has realeased, it works perfectly. System Mechanic Pro 10 has a lot of new improved features. Currently using the trial version today. hi i don’t have a single tuneup in my system, so i would be very grateful if i can get this key, i don’t have the financial backing to buy the full version. please send a licence key of system mechanic profession 10. System Mechanic is the perfect tool for any PC worldwide, I love it! P.S I don’t have any account in “social community” but i hope you include me in this giveaway!!! I would be very happy to be part of this give-away. Am looking looking forward to using this product again. The winners of System Mechanic 10 giveaway are achu, Nathan, Frankie and Luchriste. Please contact us to get your key. i’v been using system mechanic since its version 6 application and ands really does a hell of a job in speeding up my pc. hope i can have a license subscription for this new system emchanic 10. thanks admin! system mechanic is the best for all regular PC home users who do not know how to speed up their system and protect it.The dll defrager is great. I need this, it’s amaizing. I have fast machine with System Mechanic. I’m happy that I’am one of the winners. Please send SM 10 Pro key to my email A/C. Thanks, All the Best ! Winners please check the spam folder in your email account in case you missed the license details. I received the System Mechanic 10 Pro license key. Nice and great software ! I would like to try this version 10 and for it please send the key as above mentioned. Thks and all the best for all. i cant buy the code form the web site can any body help me? mybe i can get afree code to? System mechanic 10 is one of the best PC repairing tool in the world. It repairs almost every PC registrations or temporary files or applications which are not necessary. I’m a Microsoft Certified Systems Engineer and I know systems in and out. The first (and really only) software I recommend to users to keep their systems tuned up is Iolo System Mechanic. Version 10 pro has some really nice additive feartures including optimizing my most frequently used apps. Its footprint on the system has gotten much lighter over the past few years and deserves PC Magazine’s Editors Choice! Good going Iolo! please send the key as above mentioned….. I started with system mechanic 3, and worked my way thru all the versions, my registration ran out sys 9 pro, and due to financial circumstance cant renew it. I reformatted my comps and didnt install again as its out of licence. I feel so lost without my sys mech on my comps . I loved it as it cleans all my crap with pc total care, love the memory mechanic, as I can recover ram as I need it. I have tried other programs, but with system mechanic pro u dont need them, as it does it all. I used to have speedy clean comps, now its a struggle with the free programs to get the same results as I did with System Mechanic pro. Fast and intuitive interface. Slick appearance. GUI outstanding. I have been a user of iolo’s System Mechanic since I picked up a copy of SM4 on sale at my local Walmart. Every time they came out with a new iteration, I’d try it before I bought it. With SM 10… WOW! I was impressed with everything they did with it. The new toolset blew me away. I have used several other programs in a similar vein, but not one even comes close. iolo & SM has one happy customer on their hands! IOLO SYSTEM MECHANIC , THERES NOTHING LIKE IT OUT THERE .IVE TRIED OTHER SOFTWARE OVER THE YEARS SYSTEM MECHANIC JUST BLOWS THE REST AWAY…….. I been a user of System Mechanic software, and been very pleased with it. I would love to get the activation serial key giveaway as well. My 30 day trial time as ran out, so would appreciate it. Thank you. please i want sytem mechanic 10 pro license code and license key. Best of the best mechanic for your computer. I kept on using the free trial for nearly 2 years. No other programes can beat this one. I’m very satisfied . . System Mechanic 10 is more advance than before. I’m going to use it forever (even with the free trial). System Mechanic is great. Looking forward to the update to 10. Thanks for doing this, guys. Just recently tried System Mechanic 10 trial. Works perfectly, speeds up my computer so much it hurts! Will continue to useas long as it exists. K.I.S.S. – keep it simple stupid and System Mechanic 10 does that with finesse. With the push of a button you can have the software analyze your computer system and repairs windows problems that are slowing your computer down. This works with the latest version of Windows as well as the older ones. I particularly like the ALL-IN-ONE tools section of the software which will help you to custom speed your computer geared to wards how you use yours. Free up memory, hard drive space, speed up your INTERNET, and get rid of the lag you might be experiencing on your system. Great Product three thumbs up. I would love to get System mechanic 10 Pro on my system. I am currently running Security 360 pro and Advanced System Care pro both from Iobit and they have made a huge difference to the performance of my PC. Hope I win a key for this great software package. I will spread the word on facebook. How do i claim the serial key giveaway? Well I have just installed it and so far so good. System Mechanic quickly found problems with the registry, unused files, temp files, tweaked up the internet connection and a few other things. I like it so far, I’m sure I will continue to use it. Please give me the activation key for System Mechanic 10 Pro. I love this tool program too……Thanks a lot and best regards……from me. well ,I have tried norton 360 .but i will recomend to all friends & no friends to go whith system mechanic is just the best it really speed up your computer,norton do not have all the futures system mechanic have . system mechanic is a great utility which everyone must have on their computers ,It is the best software i have ever used. it`s really great.it fixes all registery problems & start up & everything that needs to be fixed to speed up my pc ! personally speaking i think it is one of the best tuneup software in the market, infact the distance it gives other software is like the distance between the earth and the stars in terms of performance. For sure it is one in a trillion. Hy Admim, please send me the activation code of system mechanic 10. System mechanic is working great on my computer! Thanks again! I live in Cuba, there’s no chance for me to get the activation code. I built myself a computer, gathering pieces of broken PC’s so System Mechanic is like air for my hybrid computer. After a whole day (connection here is horrible) I could download the software; well, it is fabulous, so if someone can send me the code to my mail will win a loyal friend forever. I have used 2 previous versions the latest being system mechanic 7. Although this is dated it carries on cleaning my computers to a very satisfactory level. I am interested in this new version 10 as it boasts of additional deep cleaners which proves yet again that the IOLO engineers are the best in the trade. Fantastic system! if anyone has any doubts about the ability of its programs you have nothing to fear. Money well spent. I hope if this is true , I am verymuch eagar to use SM10 instead of any identical software. Pl. issue the free key to in corporate SM10 in my machine. I have a friend who uses system mechanic 9 and loves it. I am excited to start using this for my system. I have used System Mechanic now since the the early versions ,I have tried others but keep coming back to it as it is excellent and user friendly. Awesome! makes my pc run just like new! I have used System Mechanic few years ago in thw Windows 2000 days, it was very useful. Now I had problems with Windows XP so I decided to use the evaluation copy of ver 10 which as expected worked fantastically. I got rid of all major issues. I would like to regularly use the System Mechanic. i’m very happy with system mechanic 10’s performance. i dont want anything else to keep my pc clean. it’s running great and has been for a long time. it’s easy. i set to run a clean up and leave the house and it shuts my pc down for me when it’s done. i love that! It just adds a booster rocket to your PC. Amongst the best software i have ever used Slick, Simple & easy. I really rate this software, having tested other similar products there is only one that is comparable……..which I’m not going mention here as it’d negate this positive review! one of the best tune up softwares available in the market!!! I need it desperately because its really an all in one pc mechanic and will definitely help me to fit my PC’s health. Thanx a lot. The best program for tuning the pc. Great!!!! its one of the best PC maintainence software i have ever come accross. i v been usng it for last 3 years and its simply amazing.!! thnx again.